This week started off with a continuation of addressing the pending reviews still on the pull request which did not get merged the following week. I went further and continued writing some tests. I also during this week had to make a presentiation of the work i've done so fare till date. This i made following some reviews of past works that i saw in past gsoc students. I started by creating a youtube channel then i went further to create a power point presentation after i got the presentation working. I had as a next challenge in making a video explaining what my presentation is talking about. Below is a front page of my presentation of the work i did. 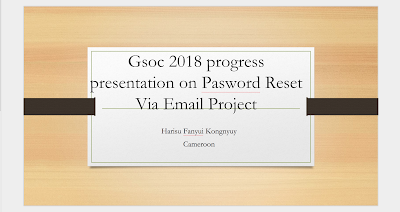 .Aslso the link to the you tube presentaion can be found here Password Reset Via email Project -gsoc midterm presentation. Overview. 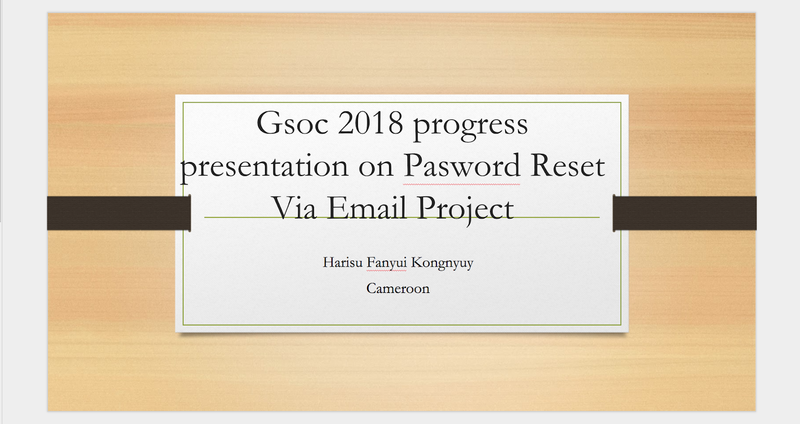 This project aims at adding new feature into openmrs, ie that of which to allow users to perform self service resetting of password. This is going to do away with the bottle neck on the admins of having to carryout the password reset for other users by generating temporal password so when they log in they can reset. Or by allowing the users to provide some secret answers to secret questions that were previously provided. This new feature will allow users to request for password reset to be done via email and most importantly it should work and allow all these actions to be carried via reset webservice. Monday 14th May 2018 marks the end of community bonding period and the beginning of Gsoc coding . During this week, I did the following. the software that you build and the community that uses the software you build. Importance of good algorithm design.